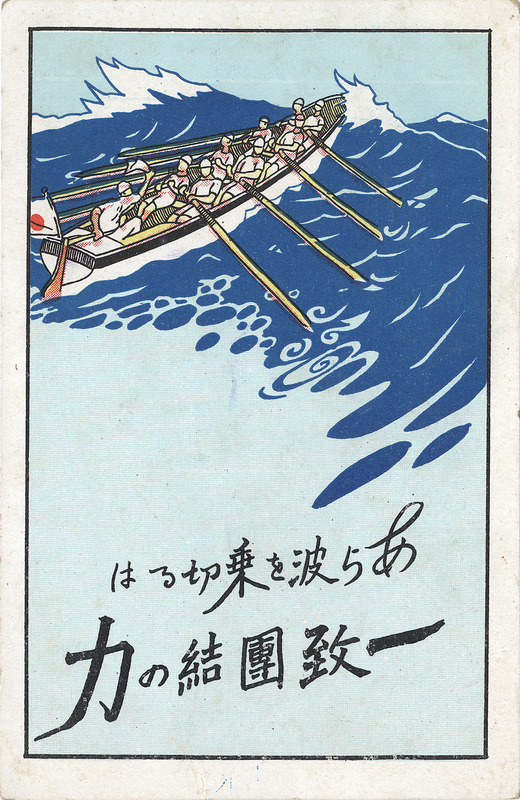 “Solid nation union to sail in rough sea” (We are all in this boat together) propaganda postcard, c. 1940. “By the 1930s the Japanese had already recognized that propaganda grew from a relationship between the state and the people and could not simply be imposed on them. Yokomizo Mitsuteru, the director of the Japanese government’s influential Cabinet Board of Information, said this explicity. “The Japanese did not view the goal of propaganda as the creation of a dependent population. To Japanese officialdom in the 1930s, propaganda meant the cultivation of cultural values and attitudes that would be held so deeply they would appear innate and not imposed.